MARKET SHRUGS OFF CRR SHOCK - 29/01/2010. The RBI shocked the market in its credit policy by hiking the CRR by 75bps to 5.75%. The market was expecting an increase in CRR by 50bps, but the RBI surprised one and all by increasing the CRR by as much as 75bps and left the key interest rates like the Repo and Reverse Repo unchanged. The hike in CRR will absorb Rs. 36,000 Cr from the system. The RBI plans to rein in the inflation by absorbing excess liquidity. RBI has also raised the GDP forecast to 7.5% for the current year, which is quite bullish. The market went down in a knee jerk reaction due to the RBI action, but managed to bounce back and closed the day in green. The market continues to be in a short to medium term downtrend but it was so excessively oversold and hence a bounce was expected. It happened after the CRR hike on Friday. Even as the market continues to be in downtrend, both the indices have formed a Hammer, which is a Bullish reversal pattern. One can expect the short term bounce to continue till the low of the hammer (Sensex 15982 and Nifty 4766) is not breached. The medium term trend will turn up only if the Nifty manages to close above 5110 and Sensex above 17132. Till then the market will continue to witness volatility in the coming week. The Sensex opened the week at 16847, made a high of 16877, a low of 15982 and closed the week at 16357. The Sensex closed the week with loss of 502 points. Similarly Nifty opened the week at 5034, made a high of 5035, a low of 4766 and closed the week at 4882. The Nifty too closed with the week with a loss of 154 points. Both the indices managed to register a weekly black body candle with a longer lower shadow. On the daily charts on Friday, both the indices formed a Bullish Reversal Pattern called Hammer. This signals that the market has started a short term bounce from oversold levels. The bounce back can continue till the lows of Sensex 15982 and Nifty 4766 are not breached. The bounce back levels for the Sensex are 16673-16886-17099 and those for the Nifty are 4974-5038-5102. 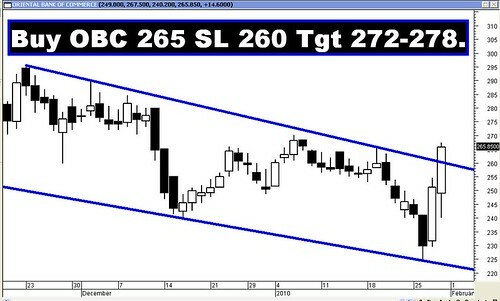 The Sensex had gone down with falling gap between 17025 and 17000 last week and this gap should act as a Resistance in the short term pull-back. Besides the falling gap, there is presence of Trendline Resistance in that area (17013) and hence as a result Sensex will face strong selling pressure at that level. The Nifty has strong Trendline Resistance at 5030, which is coinciding with the 50% pull-back level (5038) and 100dma (5012). Hence the Nifty will find difficulty in crossing Resistance zone of 5012-5038. 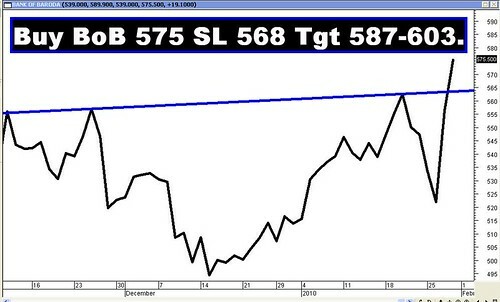 Both Sensex and Nifty have given a Bearish Rising wedge breakout. The targets for the Sensex are 15714-15373 and Nifty 4684-4587. These targets are valid as long as the Sensex remains below 17246 and Nifty below 5215. Interestingly the lower target for the Bearish wedge (Sensex – 15373 and Nifty – 4587) almost coincide with the 200dma (Sensex – 15425 and Nifty 4607), along with the higher bottom (Sensex – 15330 and Nifty – 4538). There seems to be a confluence of supports between Sensex 15425-15330 and Nifty 4607-4538 and hence one can expect strong support coming in at those levels in case of further downfall. Both Sensex and Nifty were held by the Trendline joining the higher bottoms of Sensex 13219-15330 and Nifty 3918-4538. This Trendline got breached and as a result we are correcting the rise of Sensex from 13219-17790 and the correction levels are 16044-15505-14965. The Nifty is correcting the rise from 3918-5310 and the correction levels are 4778-4614-4450. During the course of the past week, both the indices have already touched the first correction level and rebounded. Since the indices have managed a close below the 50dma, the short to medium term trend has turned down. The long term trend is still intact as the higher bottom formation has not been broken in both the indices. The long term trend will reverse when the Sensex breaches its higher bottom at 15330 and Nifty 4538. The medium term trend will turn up when the Sensex manages a close above its 50dma (17132) and Nifty above (5110). Nifty OI PCR is at 1.16, which is quite reasonable, considering the Feb series has just started and that too on a light note. Call writing is seen at 5000 strike and Put writing is seen at strike of 4800, 4700. Hence one can assume that the market is likely to find support at 4800 on the lower side and will find difficulty in breaching 5000 levels on the higher side. For the week ahead, Sensex will face Support at 15425-15700-15982 and will find Resistance at 16577-16820-17025. For the week ahead, Nifty will face Support at 4766-4693-4599 and will find Resistance at 4943-5036-5110. All the Sell Recommendations achieved their targets with ease. One should adopt such pair strategies when the market is uncertain and volatile. Tata Steel was the star performer on the Sell side.